Our inspection services and our unique reporting system provides our clients with detailed, photo filled reports that are 100% personalized to your particular needs. While our home inspections include a complete walk through, not every situation calls for a complete inspection. You may choose one or more of the below services individually. Compass Inspectors has an all-inclusive inspection package to give you piece of mind and honest approach to your inspection cost. You only have one chance to get your inspection right when buying a home don’t risk it with inexperience or sales tactics. We provide home inspections in New York and Connecticut with an all-inclusive pricing so you can buy that new home with confidence. We include full report with pictures and deliver the report via link to our cloud so not emailing of report is needed. I provide as much information as possible for the property you are considering whether you are buying your fist home or an investor I can provide you with an impartial and objective inspection to eliminate unwelcome surprises. My reports are designed to provide you with the most detailed and simple to understand information to allow you to make an informed and educated decision. We provide a custom report for your home not a template or watered down information. We don’t just hand over a report and let you fend for yourself we care. Compass inspectors provides Commercial Property Assessment Inspections (also known as Due Diligence Assessments) and consulting services to assist investors, companies, developers and lenders in the decision making process when purchasing, leasing, selling, investing, rehabbing, lending and managing property. Compass Home Inspectors uses Thermal Imaging is one of our tools to detect hidden issues during a home inspection. Thermal Imaging is one of our tools to detect hidden issues during a home inspection. Thermal imaging has now been in place for a number of years within the building industry and has been used to find problems with building material. General plumbing leaks and faulty electrical and mechanical systems. Compass Home Inspectors Westchester uses Thermal Imaging is one of our tools to detect hidden issues during a home inspection. Roof leaks can cause mold growth and major issues in the attic area. Basement issues are more common in older homes in Westchester NY the use of thermal imaging can find basement issues. The cost of energy in New York is at an all-time high and rising. 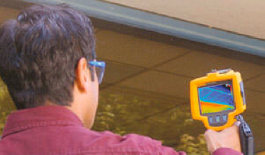 Thermal imaging inspections are useful for energy audits in Westchester NY because you can see exactly where cold air is entering the home or heat is being lost, along with energy dollars. Thermal imaging has also been used successfully to help locate loose electrical connections or overheated breaker boxes by identifying “hot spots”. Some electrical panels used even up to 2011 have been recalled or found defective and infared scan can detect defective circuit breakers. Thanks to thermal imaging, Compass Inspectors have the ability to examine roofs, floors and walls for moisture intrusions, energy loss and electrical problems faster and more thoroughly For your home inspection. Thermal imaging cameras have quickly become the “must have tool” for IAQ Professionals. Not only is this sophisticated technology is used in every Compass mold inspection, it is also used in every post-remediation verification survey to ensure that building materials have been thoroughly dried out before any reconstruction work begins. If construction materials are not completely dry, mold growth will reoccur. Infrared technology eliminates the guesswork and provides quick visual assessment of the thoroughness of dry out job. The U.S. Department of Housing and Urban Development’s (HUD) Healthy Program helps makes our home safer. The program provides homeowners and rental property owners with practical information about how to prevent health and safety hazards. Making Your Home a Healthier and Safer Place to Live. We will take one or two (depending on weather and wind conditions) exterior air samples, one air sample from the basement or first floor and one air sample from the HVAC system (if the home has hot air heat). The fee typically does not include any inspection or surface testing at all, just mold air testing. If desired mold swab tests or additional air samples can be taken and tested for mold for additional cost each while we are on site. Take three mold test surface samples with swabs. Total fee for listed service various for each inspection . Additional swab mold tests are additional cost each. No inspection or air testing are included. Inspect the exterior of the building such as the roof from ground level or eaves or walk the roof if it accessible from our 12′ ladder and it is safe to do so, the roof covering, roof drainage system, including gutters and downspouts, vents, flashings, skylights, chimneys, and any other roof penetrations, the cladding, flashing and trim, exterior doors, windows, decks, stoops, steps, stairs, porches, railings, eaves, soffits and fascias, grading surrounding the building perimeter and items that penetrate the exterior siding or covering materials. On the inside we will inspect the basement, foundation, crawl spaces and structure for ventilation issues and for moisture intrusion. We will inspect components and parts of mechanical systems such as the heating, cooling and ventilation including the air handler, circulating fan, and air filter, condensate pump, readily visible ductwork, a representative number of supply and return air registers, central humidifier and the central air conditioning unit. We will also inspect the attic, ventilation, insulation, framing and sheathing. the interior walls, ceilings, floors, doors and windows, ventilation in the kitchen, bathrooms and laundry as well as whole house ventilation fans. Take one or two (depending on weather and wind conditions) exterior air samples, one air sample from the basement or first floor and one air sample from the HVAC system (if you have hot air heat). If areas of suspected mold growth are found we will show them to you and provide you with our input as to how many swab samples should be taken and sample them for additional cost each. While many odors smell “like mold” and look “like mold” the only way to tell if they are actually mold and to determine if they are a toxic mold is to perform testing. We are equipped to take mold samples in case a visual non invasive home inspection discovers the need for further evaluation and testing. The color of mold (black mold, green mold, white mold) is not an indication of exactly what the problem is. When purchasing a home with a septic tank, it is advisable to have it inspected. Repairs and replacement can be very costly as well as possible fines for faulty systems. Compass Inspectors will do a complete inspection that will include visually verifying performance of the septic drain system, visual inspection of the tank where an accessible lid is available, and inspection of the leach field area. With the rising cost of utility bills that are now starting to crepe up on us as the winter is making its presence known. Let me help you find where your money is escaping and help you save on those rising utility bills. I have purchase a new tool to add to my arsenal of Home Inspection tools. The new Thermal Leak Detector which helps reduce energy costs by finding energy leaks in your home. I can instantly identify problem areas around drafty windows and doors, and uncover hidden leaks and insulation “soft spots” around electrical outlets, recessed lights, and along floor molding. When the device hits a cold or hot spot, an LED indicator light changes to blue or red depending on the type of temperature change registered. Let me help you find and seal energy leaks where you can save up to 20% on heating and cooling costs! If you have any other questions, please feel free to contact me. This is a very affordable inspection that will help you save money, please call me today to get a quote. Compass Inspectors offers comprehensive, independent and cost-effective Home Maintenance and Safety Inspections. All reports can be obtained online. Our job as your professional home inspector is to alert you, to the extent possible, to unknown conditions and potential environmental hazards in your current or potential house. As well as anything that may indicate a serious structural problem that may be the result of poor structural design, foundation settlement, poor construction techniques, improper structural modification, water damage, termite damage or other causes. Our Conditions and Hazards Report includes a clear description of conditions found so you can easily identify them. Radon is a carcinogenic gas that is hazardous to inhale. Build-up of radon in homes is a health concern and many lung cancer cases are attributed to radon exposure each year. About 12% of lung cancers and more than 20,000 Americans die of radon-related lung cancer each year. You cannot see, smell, or taste radon. But it still may be a problem in your home. When you breathe air containing radon, you increase your risk of getting lung cancer. We specialize in water analysis, radon testing, and sample collection. So when you need a first-rate outfit to handle your lab work, come to us. When it comes to the complexities of water analysis, radon testing and sample collection, we know you’re going to have questions. Whether you suspect that you may have a termite problem in your own home or business and want your property/building inspected for termites; or you want a routine termite inspection; or you need a residential or commercial property inspected for a sale or purchase. When it comes to termite inspection in Westchester and Putnam county, you won’t find another company as committed to your satisfaction. Compass Inspectors is fully independent and works for you, not a realty office or any other business that wold skew your report. Compass Inspectors is fully licensed and insured. Compass Inspectors have the experience needed to identify potential sources of lead in your home or commercial property. Lead was used in paint products up until 1978, and it is safe to assume any home or commercial property built prior to 1978 will contain lead. We are familiar with the most common products that have been known to contain lead, and will share any safety concerns with you in our detailed, easy to read reports.